ESFJs are known as “The Caregiver’s” in many type descriptions. They are known for their generosity, attention to detail, and loyalty. That said, there are certain things that they really hate to hear, even from their closest friends. What are they? Let’s find out! ESFJs are hard workers and are especially dedicated to the people they love. Being told their efforts aren’t enough is a major slap in the face to them. Many times these kinds of comments come from people who either don’t see all the work they are doing behind the scenes, or from people who are just trying to take advantage of their generosity. On the flip side of “you’re not doing enough” is the “trying too hard” sentence. ESFJs care a lot about the needs and desires of the people around them. It’s built into who they are, and when people find a reason to get annoyed at them because of it it’s insulting. If you’re a thinker and you’re reading this, it’d be like saying “You think too much” (this is a major turn-off for thinking types). Yes, ESFJs try. They try very hard to care for their loved ones. Sometimes they could use a break, but their tendency to care isn’t something to be patronizing about. If you’re telling them they try too hard because you really want to give them a break, try to word it as “You need a break. Let me help you!” This will come across much better. ESFJs have very strong values and their feelings about things stem from their ethics and sense of right and wrong. If something conflicts with their values it does matter to them and it’s probably a good idea to hear them out. Any type is capable of being emotionally unreasonable, but you have to know the difference between what is unreasonable and what is a true conviction that needs attention. ESFJs tend to take things personally and are very careful about how they give criticism. If you have to critique something an ESFJ is doing, try to mention points of agreement or affirmation simultaneously. If they do get offended don’t mock or patronize them as that will only frustrate them further. ESFJs are extremely dedicated to keeping their commitments. Forgetting about engagements, showing up late, or constantly shirking appointments and meetings will really get on their nerves and says to them that you don’t really care that much about the relationship or friendship. While many ESFJs can understand the logic behind rule-breaking, they tend to adhere to rules. Usually when people make a statement like the one above it’s to make the ESFJ feel like a “goody goody”. Nobody likes this. ESFJs tend to be enthusiastic and affirming friends. They try to find points of agreement with people and strive to keep the morale at a good level. Sometimes their warmth and friendliness is met with skepticism by other types. 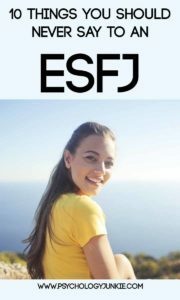 While unhealthy ESFJs can be overly people-pleasing or phony, most average or healthy ESFJs are genuine people who really care about having an atmosphere of harmony. Don’t misunderstand their gregariousness for phoniness! Trolling, teasing, and manipulating someone just to get a reaction is a major pet peeve of ESFJs. They care a lot about words and the effects they have and will be majorly turned off by people who use them to tease/mock/or belittle other people. This one’s pretty obvious. Letting an ESFJ know that you don’t care about what they’re saying or doing will always make them feel trivialized. Even if they’re asking you what you want for dinner it’s good to give some kind of an opinion or at least several options to choose from. ESFJs tend to be very goal-oriented and productive people. They like to have closure and finish projects/tasks right away. Putting things off and procrastinating causes them stress and frustration. Do these statements bother you or do you have different ones to add? Let me know in the comments! Wow, every one of these made me wince! You hit the nail right on the head! ? I really enjoy your blog; it’s been so helpful to me in figuring out my type and understanding other types better. Thank you!